Chronic thromboembolic pulmonary hypertension (CTEPH) is a complication of pulmonary embolism and a major cause of chronic PH leading to right heart failure and death. Lung ventilation/perfusion scintigraphy is the screening test of choice; a normal scan rules out CTEPH. In the case of an abnormal perfusion scan, a high-quality pulmonary angiogram is necessary to confirm and define the pulmonary vascular involvement and prior to making a treatment decision. PH is confirmed with right heart catheterisation, which is also necessary for treatment determination. 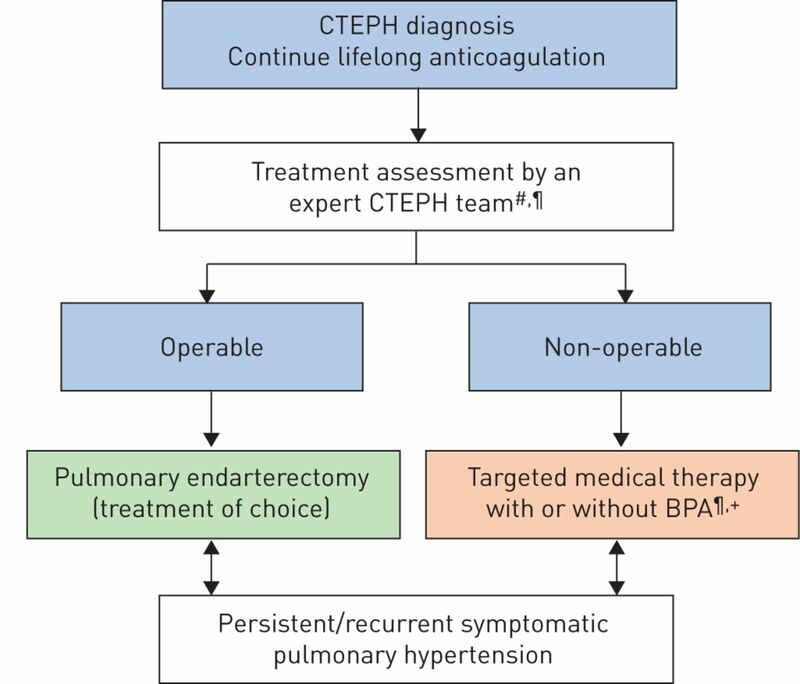 In addition to chronic anticoagulation therapy, each patient with CTEPH should receive treatment assessment starting with evaluation for pulmonary endarterectomy, which is the guideline recommended treatment. For technically inoperable cases, PH-targeted medical therapy is recommended (currently riociguat based on the CHEST studies), and balloon pulmonary angioplasty should be considered at a centre experienced with this challenging but potentially effective and complementary intervention. Since the 5th World Symposium on Pulmonary Hypertension (WSPH) in 2013, major progress has occurred in the understanding and management of chronic thromboembolic pulmonary hypertension (CTEPH). First, the link between CTEPH and acute pulmonary embolism, and some of the challenges associated with making the connection, will be reviewed. Key diagnostic steps in establishing early and accurate diagnosis will be emphasised. Each component of the current CTEPH treatment approach will be overviewed. Finally, an updated treatment algorithm is proposed taking into account the advances since 2013. CTEPH is classified within group 4 PH , and is characterised pathologically by organised thromboembolic material and by altered vascular remodelling initiated or potentiated by a combination of defective angiogenesis, impaired fibrinolysis and endothelial dysfunction [2–4]. These changes lead to PH and ultimately right ventricular failure [5, 6]. The precise pathogenesis of CTEPH remains unclear, but appears to be incited by acute pulmonary embolism . However, classic risk factors for venous thromboembolism do not appear to increase the risk of CTEPH  and there are clear geographic differences in CTEPH epidemiology. An international CTEPH registry (Europe and Canada) indicated that 75% of patients with CTEPH had a documented antecedent history of acute pulmonary embolism , while in Japan, the rates of acute pulmonary embolism preceding CTEPH range from only 15% to 33% [10, 11]. There is an 80% female preponderance of CTEPH in Japan; these statistics differ significantly from the USA and Europe . A number of abnormal autoimmune, inflammatory and thrombophilia markers have been found in CTEPH patients ; it is feasible that variability in this underlying pathological milieu contributes to the variability in the worldwide CTEPH epidemiology. Furthermore, variable gene expression has been demonstrated in pulmonary artery endothelial cells from patients with CTEPH compared with normal controls . In published prospective studies with the diagnosis confirmed by right heart catheterisation (RHC) the incidence of CTEPH after symptomatic acute pulmonary embolism is reported to range from 0.4% to 6.2% [13–25], giving a pooled incidence of 3.4% (95% CI 2.1−4.4%) . Since that analysis, a new report from Switzerland screened 508 patients after acute pulmonary embolism over 2 years and found a cumulative incidence of CTEPH confirmed with RHC of just 0.79% . Determining the precise CTEPH incidence is complex. CTEPH is likely both underdiagnosed and the incidence of CTEPH after acute pulmonary embolism prone to overestimation, making the actual incidence difficult to quantify. Non-specific symptoms, variable rates of antecedent acute pulmonary embolism and the expertise required to read computed tomography pulmonary angiography (CTPA) contribute to underdiagnosis [27, 28]. Underdiagnosis is further compounded by the infrequent use of lung ventilation/perfusion scintigraphy (V/Q scan) despite guideline recommendations [29, 30]. Approximately 30 000 acute pulmonary embolism cases are diagnosed annually in France, with the CTEPH incidence estimated at 3.4% . Guérin et al. suggested a CTEPH incidence of 4.8%. Neither of these estimates is consistent with the current frequency of newly diagnosed CTEPH. A limitation of the numerous CTEPH incidence reports after acute pulmonary embolism may be attributed to an unrecognised amalgam of incident and prevalent cases . In terms of reducing the risk of CTEPH following acute pulmonary embolism, no prospective randomised acute pulmonary embolism trials have examined systemic or catheter-based thrombolysis or clot extraction with RHC as an outcome measure in patients with persistent symptoms. Claims have been made that the incidence of CTEPH in patients receiving thrombolytic therapy is reduced, but end-points such as an echocardiogram-derived systolic pulmonary arterial pressure (sPAP) of 40 mmHg do not define PH or CTEPH . Systemic thrombolysis failed to reduce the risk of CTEPH in intermediate/high-risk (submassive) pulmonary embolism patients in the 3-year follow-up of the PEITHO trial (average sPAP at follow-up was around 31 mmHg in each group) . To date, there is no proof that aggressive treatment of acute pulmonary embolism can prevent CTEPH. Chronic thromboembolic disease (CTED) is characterised by similar symptoms and perfusion defects, but without PH at rest. Currently a new threshold for PH (mean PAP (mPAP) >20 mmHg) and pre-capillary PH (combination of mPAP >20 mmHg, pulmonary arterial wedge pressure ≤15 mmHg and pulmonary vascular resistance (PVR) ≥3 Wood Units) has been proposed by the 6th WSPH Task Force on PH diagnosis and classification . While there is good evidence to suggest these new thresholds, the consequences for CTEPH and CTED, respectively, are not yet established. In the future, however, these new thresholds might also be applied to group 4 PH. Exercise limitation in CTED has been attributed either to exercise-induced PH, with an increased slope of the pulmonary arterial pressure–flow relationship, or to dead-space ventilation, with increased ventilatory equivalents for carbon dioxide [34, 35]. Both new and worsened dyspnoea and persistent perfusion defects are often encountered after acute pulmonary embolism, in, respectively, 30% and 30–50% of patients, which makes the recognition of CTED challenging [18, 36, 37]. Cardiopulmonary exercise tests and echocardiographic evaluations are recommended to exclude patients in whom symptoms are related to lung disease, left heart disease, obesity or deconditioning. A tentative, comprehensive definition of CTED is proposed in table 1. Selected patients with CTED may benefit from pulmonary endarterectomy (PEA) as shown in a series of 42 patients out of 1019 who underwent surgery in the UK reference centre . Post-operative improvement in symptoms, functional class and quality of life were reported. However, while there was no in-hospital mortality, major complications occurred in 40% of the cohort (small subdural haematomas, tracheostomy). Although endarterectomy is aimed to prevent subsequent disease, the natural history of CTED is unknown and there is no evidence that CTED evolves to CTEPH. At present, patients with CTED represent a group in need of both symptom relief and better understanding of their disorder. CTEPH treatment guidelines should not be applied to CTED. A normal V/Q scan effectively excludes CTEPH with a sensitivity of 90–100% and a specificity of 94–100% [39, 40]. In a study of confirmed cases of CTEPH, V/Q scan was found to be superior to CTPA with a sensitivity of 97.4% versus 51% . This difference has narrowed as CT technology and interpretation have advanced. Indeed, a more recent study has shown that both V/Q scan and CTPA are accurate methods for the detection of CTEPH with excellent diagnostic efficacy (100% sensitivity, 93.7% specificity and 96.5% accuracy for V/Q scan; 96.1% sensitivity, 95.2% specificity and 95.6% accuracy for CTPA) . However encouraging, V/Q scan remains the preferred initial imaging test for CTEPH screening [5, 29]. Recent retrospective studies have also assessed the diagnostic accuracy of three-dimensional dynamic contrast-enhanced lung perfusion magnetic resonance imaging (MRI) against planar V/Q scan or SPECT (single photon emission CT) scan as a screening tool for CTEPH [41, 42]. These studies demonstrated that dynamic contrast-enhanced lung perfusion MRI has a similar sensitivity (97%) for diagnosing CTEPH when compared with planar V/Q scan and a higher sensitivity (100% versus 97%) when compared with SPECT scan. Prospective studies examining the value of lung perfusion MRI and SPECT scan as a screening test for CTEPH are required to address the clinical utility (including their costs) and diagnostic performance of these modalities. Digital subtraction angiography (DSA) had been considered the gold standard for characterising vessel morphology in CTEPH, but is being challenged by advances in non-invasive modalities. CTPA is currently widely used for assessment of operability. CTPA in more recent reports has a high sensitivity and specificity in detecting chronic thromboembolic lesions at the main/lobar (89–100% and 95–100%, respectively) and segmental (84–100% and 92–99%, respectively) levels [43–45]. CTPA can also be valuable by revealing bronchial artery collaterals, which can correlate with more central disease , and by evaluating the lung parenchyma and mediastinum. Advanced CT technologies, including dual-energy CT (DECT), ECG-gated area detector CT (ADCT), cone-beam CT (CBCT) and contrast-enhanced magnetic resonance pulmonary angiography, are emerging as valuable modalities for detailing the pulmonary vasculature. With advances with distal endarterectomy and the advent of balloon pulmonary angioplasty (BPA), and general focus on more distal vascular assessment, conventional DSA may not always be suitable for providing fine details. More selective segmental angiography, CBCT and ADCT may be better for pre-BPA planning by providing greater resolution than conventional DSA, particularly in the more distal vessels . These imaging techniques are not widely available and require expertise. PEA should be offered to all eligible patients with CTEPH. The international registry of incident cases of CTEPH reported 3-year survival of 90% in those operated and 70% in those not having surgery . Long-term follow-up of a large cohort reported 10-year survival of 72% (average age 58 years) . Death was attributed to unrelated causes in 49% of patients; residual PH with PVR ≥425 dyn·s·cm−5 correlated with worse survival . Strict objective definitions of operability remain elusive, but certain features are more likely to predict a good surgical outcome (table 2). While select patients may be technically operable, they may not benefit from endarterectomy due to significant comorbidities; the best treatment for such cases remains uncertain. The traditional routine of inserting an inferior vena cava filter (IVC) device prior to endarterectomy has not been formally studied and has been abandoned at the leading surgical centres. In the international registry, IVC filter prior to surgery did not influence long-term survival . The most important surgical advance has been in redefining the distal limits of endarterectomy [50, 51]. In expert centres, surgery can be performed successfully in patients with distal chronic thromboembolism . The advances in diagnostics and growing surgical experience have contributed to this success. As a result, the previously published intra-operative classification  has been refined to better reflect the current surgical approach and level of revascularisation (table 3) . This also means not all surgical centres will view operability in the same manner . A three-step stratified definition of expert surgical centre has been proposed which factors the following important goals: surgical mortality (<5%), surgical volume (more than 50 PEAs per year) and ability to perform segmental endarterectomy . Furthermore, in this era of a comprehensive approach to CTEPH, an expert centre should be capable of evaluating and offering any/all established treatment modalities according to individual need. The place of PH-targeted medical therapy and BPA relative to surgery is dependent on the anatomical distribution of disease and is not fully defined. Combining endarterectomy with BPA either as a hybrid or stepwise approach is being evaluated at select expert programmes . In the CHEST-1 study, riociguat was beneficial for patients with residual PH after endarterectomy . A trial is needed to clarify if PH-targeted medical therapy prior to endarterectomy in operable patients confers harm or benefit (ClinicalTrials.gov identifier NCT0327357). BPA has evolved into an important component of the CTEPH treatment algorithm since the 2012 reports from Japan [56–58]. BPA has been reported to improve haemodynamics, symptoms, exercise capacity and right ventricular function, with significantly lower rates of major complications than compared with the report from 2001 [59–62]. In retrospective analyses, the benefits of BPA also appear to be maintained in the medium term [10, 63]. Subsequent publications from Europe report similar results [64–66]. The recent BPA series from Germany is unique as these centres started BPA alongside a well-established PEA programme . Although their complication rates were similar to those from Japan, the magnitude of efficacy (e.g. PVR reduction) was less in comparison with the reports from Japan. The potential explanations offered included the possibility of differences in operability threshold and the variability in the types of patients treated with BPA between centres. Although these results of BPA are encouraging, the reports are from expert centres and may not be generalisable. Even with the technical refinements, there remains a steep learning curve in order to safely, effectively and consistently perform BPA . A successful BPA requires extensive training and case experience. BPA should be reserved for expert centres, where it should be considered for symptomatic CTEPH patients ineligible for PEA due to distal chronic thromboembolism or persistent/recurrent PH after surgery. The role of BPA for those with technically operable disease, but who are unsuitable for surgery due to subjective determination or patient refusal, has not been established. BPA patient selection at an expert centre starts with a multidisciplinary review of all available and pertinent data. Anatomical and functional assessment of pulmonary arteries and lung perfusion are critical to identify the target vessels . A selective pulmonary angiogram of the target vessels will show more details and serves as confirmation prior to intervention during BPA. A selective angiogram may not capture all the distal lesions potentially amenable to BPA, necessitating multiple complementary imaging modalities such as intravascular imaging and pressure gradient analysis to aid in lesion assessment and balloon sizing . BPA complications should be defined and uniformly reported. Unlike reperfusion lung injury after PEA which can be delayed for days before onset , the injury associated with BPA appears to be more vascular injury related to the intervention than the capillary leak syndrome described post-PEA . Table 4 is proposed as a guide for BPA centres for classification of complications. Injury caused by wire perforation or interruption of the diseased vessel is the most common . Lung injury by wire perforation or balloon overdilatation in the setting of severe PH risks potentially fatal massive infiltration and/or haemorrhage which may require mechanical ventilation or extracorporeal support. Classic reperfusion lung injury is rare with BPA. Published low BPA complications reflect limited experience confined to experienced BPA centres. In experienced hands, BPA has emerged as a promising and established treatment for inoperable CTEPH. While PEA remains the treatment of choice for most patients with CTEPH, around 40% of the patients in the international CTEPH registry were considered inoperable due to concern for inaccessible vascular obstruction, PAP out of proportion to morphological lesions and significant prohibitive comorbidities . A large number of small studies and three large randomised controlled trials (table 5) have demonstrated varying improvements with targeted medical therapy in technically inoperable patients [55, 73, 74]. However, data are lacking for patients with medical contraindications or those refusing surgery. Riociguat is the currently approved medical therapy in many countries for inoperable CTEPH based on the CHEST trials [55, 75]. Recently, the MERIT-1 trial of macitentan in the treatment of inoperable CTEPH showed improvements of the primary end-point (PVR (p=0.041)) and of other end-points (e.g. 6-min walk distance (p=0.033) and N-terminal pro-brain natriuretic peptide (p=0.040)) . This last study provided the first evidence on combination drug therapy in CTEPH. 61% of the included patients were already treated with phosphodiesterase type 5 inhibitors and/or oral/inhaled prostanoids at inclusion, and addition of macitentan showed similar efficacy compared with the drug-naive patients. Accordingly, macitentan is being considered for potential CTEPH registration. Event-driven morbidity/mortality studies have not been performed in CTEPH. Patients with persistent/residual post-operative PH were also included in BENEFIT and CHEST-1, representing around 30% of the study population [55, 73]. Both studies included patients with mPAP ≥25 mmHg and PVR ≥300 dyn·s·cm−5 at >6 months after endarterectomy. This can be put in perspective with real-life data from the large UK national cohort, in which 3–6 months after PEA: 1) 51% of the patients had mPAP ≥25 mmHg, 2) mPAP ≥30 mmHg predicted initiation of PH-targeted medical therapy, and 3) mPAP ≥38 mmHg and PVR ≥425 dyn·s·cm−5 correlated with worse long-term survival . Using medical therapy as a “bridge to PEA” is more controversial, and is felt to delay timely surgical referral and, therefore, definitive treatment. In the international registry and in a University of California San Diego cohort, 28% and up to 37%, respectively, of the patients were on some form of PH-targeted drug(s) at the time of surgical referral [9, 76]. In both cohorts, the delay between diagnosis and surgery was doubled in the pre-treated patients, without demonstrable clinical benefit. In the international registry, pre-treatment even independently predicted worse outcome (hazard ratio 2.62; p=0.0072) . Key limitations of these reports are with inherent referral bias and the possibility of medical therapy potentially stabilising otherwise deteriorating cases (unknown and not tested). In order to provide the missing evidence, a phase 2 study will soon commence to include CTEPH patients with high PVR for pre-operative treatment with riociguat versus placebo (ClinicalTrials.gov identifier NCT0327357). Using medical therapy as a “bridge to BPA”, although not studied, has become common practice and in keeping with the indication for riociguat for technically inoperable disease. A study is currently ongoing which compares riociguat versus BPA for technically inoperable CTEPH, followed by an opportunity to crossover after 6 months (ClinicalTrials.gov identifier NCT02634203). The newly proposed CTEPH treatment algorithm is provided in figure 1 and starts with lifelong anticoagulation. Antiplatelet therapy is not an alternative to anticoagulation in patients with CTEPH. Data differentiating the best form of anticoagulation therapy is lacking in CTEPH. Traditional anticoagulation has been with oral vitamin K antagonists. Whether the newer oral anticoagulants or chronic injectable anticoagulants are adequate in CTEPH is unknown. The algorithm emphasises the need for a multidisciplinary assessment, including a surgeon experienced with PEA, PH specialist, BPA interventionist and CTEPH-trained radiologist. A PH referral centre was previously defined and recommended as a minimum volume of 50 pulmonary arterial hypertension or CTEPH patients managed per year . However, given the highly specialised nature of CTEPH treatment, additional factors should be considered when gauging clinical expertise. Chronic thromboembolic pulmonary hypertension (CTEPH): revised treatment algorithm. BPA: balloon pulmonary angioplasty. #: multidisciplinary: pulmonary endarterectomy surgeon, PH expert, BPA interventionist and radiologist; ¶: treatment assessment may differ depending on the level of expertise; +: BPA without medical therapy can be considered in selected cases. In the CHEST-1 trial, central adjudication exemption and local operability assessment were allowed provided a participating centre performed more than 20 PEA operations per year . However, the majority of the operability adjudication occurred with the central committee whose members each performed well in excess of 50 operations per year. In addition, the central adjudication committee had double the rate of operability determination than the local adjudication committee (15% operable versus 7% operable, respectively). From the international CTEPH registry, a trend with the best in-hospital and 1-year post-operative mortality was observed from centres performing higher volumes of PEA, with the best results observed from centres performing more than 50 operations per year . This observation likely does not take into account the relative differences in case complexity, with potentially more challenging cases referred to higher-volume programmes. Additional emphasis on the importance of surgical centre experience was reported in the UK national registry of patients undergoing PEA . In this report, significantly lower in-hospital mortality was observed in the second group of consecutive 500 operated cases compared with the initial group of 500 operated cases. In addition, the ability for high-volume centres to perform more distal endarterectomy necessitates stratification of surgical centre expertise . A similar observation applies to BPA success; the safety and efficacy reports of the refined BPA techniques from Japan are from centres performing the highest volume of procedures (typically more than 100 per year) [58, 59]. In summary, an expert CTEPH centre should be able to assess and deliver all established treatment modalities with outcomes similar to or exceeding those published. Patients with operable CTEPH should receive PEA as the treatment of choice. For those deemed inoperable, the best level of evidence supports initiating medical therapy and consideration of BPA. Patients with persistent/recurrent symptomatic PH following PEA should receive medical therapy and be considered for BPA or re-do endarterectomy in cases of significant re-occlusion . Lastly, given the subjectivity of operability assessment, it is possible for a patient initially deemed to be inoperable to receive PEA with or without treatments for inoperable CTEPH. The new algorithm therefore allows for fluidity between these treatment modalities as information and expertise is gained. PEA remains the treatment of choice for patients with operable CTEPH. Two additional recognised treatments are now available (i.e. targeted medical therapy and BPA). A multimodal, individualised approach to treatment at expert centres integrating surgical, interventional, imaging and medical PH expertise with the development of clear outcomes analyses is mandatory going forward. Conflict of interest: N.H. Kim reports personal fees for consultancy, steering committee work and speaker bureau membership from Actelion and Bayer; personal fees for consultancy from Merck; and is a board member of the International CTEPH Association, CTEPH.com. Conflict of interest: M. Delcroix is an investigator, speaker, consultant or steering committee member for Actelion, Bayer AG, Bellerophon, Eli Lilly, GSK, MSD, Pfizer and Reata; and has received an institutional research grant from Actelion. Conflict of interest: X. Jais received grants and personal fees from Actelion, GSK, Bayer and MSD. Conflict of interest: M.M. Madani has received consultancy fees from MSD/Bayer, Wexler Surgical and Actelion, and is an executive board member of the International CTEPH Association, CTEPH.com. Conflict of interest: H. Matsubara has received lecture fees from Actelion Pharmaceuticals Japan, Ltd, AOP orphan Pharmaceuticals AG, Bayer Yakuhin, Ltd, Pfizer Japan, Inc, Nippon Shinyaku, Co, Ltd and Kaneka Medix Corporation, outside the submitted work. Conflict of interest: E. Mayer has received consultancy fees from Actelion, Bayer and MSD; and is on the speaker bureau for Actelion, Bayer, MSD and Pfizer. Conflict of interest: T. Ogo is a member of the speaker bureau for Actelion and Bayer. Conflict of interest: V.F. Tapson received research support from Actelion, Arena, Bayer, BiO2, Edwards Scientific, Ekos/BTG, Janssen, Inari, Portola, Reata, United Therapeutics, Daiichi and Penumbra; consultancy fees from Actelion, Bayer, BiO2, Ekos/BTG, Inari, Janssen, Portola, United Therapeutics, VWave, Daiichi and Penumbra; speaker bureau for Actelion, Bayer and Janssen. Conflict of interest: H-A. Ghofrani reports personal fees for advisory board work payment for lectures including service on speaker bureaus from Actelion, Bayer, GSK, Novartis and Pfizer; consultancy fees from Actelion, Bayer, Bellerophon Pulse Technologies, GSK, MSD, Novartis and Pfizer; and grants from Deutsche Forschungsgemeinschaft (DFG), outside the submitted work. Conflict of interest: D.P. Jenkins worked as adjudicator for Actelion and Bayer for MERIT and CHEST-1 studies; received honoraria for speaking from Actelion and Bayer; and is a board member of the International CTEPH Association, CTEPH.com. Haemodynamic definitions and updated clinical classification of pulmonary hypertension. Eur Respir J 2019; 53: 1801913. Risk factors and basic mechanisms of chronic thromboembolic pulmonary hypertension: a current understanding. Eur Respir J 2013; 41: 462–468. Microvascular disease in chronic thromboembolic pulmonary hypertension: a role for pulmonary veins and systemic vasculature. Eur Respir J 2014; 44: 1275–1288. Chronic thromboembolic pulmonary hypertension. J Am Coll Cardiol 2013; 62: D92–D99. Chronic thromboembolic pulmonary hypertension. Am J Respir Crit Care Med 2011; 183: 1605–1613. The pathophysiology of chronic thromboembolic pulmonary hypertension. Eur Respir Rev 2017; 26: 160112. Chronic thromboembolic pulmonary hypertension (CTEPH): results from an international prospective registry. Circulation 2011; 124: 1973–1981. Balloon pulmonary angioplasty for chronic thromboembolic pulmonary hypertension: results of a multicenter registry. Circ Cardiovasc Qual Outcomes 2017; 10: e004029.
. Analysis of Chronic Thromboembolic Pulmonary Hypertension (Intractable Disease Database). Tokyo, Ministry of Health, Wealth and Labor, 2008. Comparison of gene expression profiles and related pathways in chronic thromboembolic pulmonary hypertension. Int J Mol Med 2014; 33: 277–300. Incidence of chronic thromboembolic pulmonary hypertension after pulmonary embolism. N Engl J Med 2004; 350: 2257–2264. Incidence of chronic thromboembolic pulmonary hypertension after a first episode of pulmonary embolism. Chest 2006; 130: 172–175. van Dijk AP, et al. Prospective cardiopulmonary screening program to detect chronic thromboembolic pulmonary hypertension in patients after acute pulmonary embolism. Haematologica 2010; 95: 970–975. Incidencia de hipertensión pulmonar tromboembólica crónica sintomática y asintomática. [Incidence of symptomatic and asymptomatic chronic thromboembolic pulmonary hypertension.] Arch Bronconeumol 2010; 46: 628–633. Incidence of recurrent venous thromboembolism and of chronic thromboembolic pulmonary hypertension in patients after a first episode of pulmonary embolism. J Thromb Thrombolysis 2010; 30: 294–299. Active search for chronic thromboembolic pulmonary hypertension does not appear indicated after acute pulmonary embolism. Thromb Res 2010; 125: e202–e205. von Scheidt W, et al. Echocardiographic evaluation for pulmonary hypertension after recurrent pulmonary embolism. Thromb Res 2011; 128: e144–e147. A symptom-related monitoring program following pulmonary embolism for the early detection of CTEPH: a prospective observational registry study. BMC Pulm Med 2014; 14: 141. Prevalence of undiagnosed chronic thromboembolic pulmonary hypertension after pulmonary embolism. Blood Coagul Fibrinolysis 2014; 25: 649–653. Prevalence of chronic thromboembolic pulmonary hypertension after acute pulmonary embolism. Thromb Haemost 2014; 112: 598–605. The incidence of chronic thromboembolic pulmonary hypertension secondary to acute pulmonary thromboembolism. Tuberk Toraks 2014; 62: 199–206. Chronic thromboembolic pulmonary hypertension after the first episode of pulmonary embolism? How often? Biomed Pap Med Fac Univ Palacky Olomouc Czech Repub 2016; 160: 125–129. External validation of a simple non-invasive algorithm to rule out chronic thromboembolic pulmonary hypertension after acute pulmonary embolism. Thromb Res 2015; 135: 796–801. Multicentre observational screening survey for the detection of CTEPH following pulmonary embolism. Eur Respir J 2018; 51: 1702505.
. Incidence and prevalence of chronic thromboembolic pulmonary hypertension: from acute to chronic pulmonary embolism. Proc Am Thorac Soc 2006; 3: 564–567. Contemporary trends in the diagnosis and management of pulmonary arterial hypertension an initiative to close the care gap. Chest 2013; 143: 324–332. Monitoring for pulmonary hypertension following pulmonary embolism: the INFORM study. Am J Med 2016; 129: 978–985.
. Incidence of venous thromboembolism: a community-based study in Western France. Thromb Haemost 2000; 83: 657–660. Moderate pulmonary embolism treated with thrombolysis (from the MOPETT Trial). Am J Cardiol 2013; 111: 273–277. Impact of thrombolytic therapy on the long-term outcome of intermediate-risk pulmonary embolism. J Am Coll Cardiol 2017; 69: 1536–1544. Hemodynamic and ventilatory responses during exercise in chronic thromboembolic disease. J Thorac Cardiovasc Surg 2016; 152: 763–771. Functional characterization of patients with chronic thromboembolic disease. Respiration 2016; 91: 503–509. Van Dijk APJ, et al. Prevalence and potential determinants of exertional dyspnea after acute pulmonary embolism. Respir Med 2010; 104: 1744–1749. Resolution of thromboemboli in patients with acute pulmonary embolism: a systematic review. Chest 2006; 129: 192–197. Outcome of pulmonary endarterectomy in symptomatic chronic thromboembolic disease. Eur Respir J 2014; 44: 1635–1645. Ventilation–perfusion scintigraphy is more sensitive than multidetector CTPA in detecting chronic thromboembolic pulmonary disease as a treatable cause of pulmonary hypertension. J Nucl Med 2007; 48: 680–684. Diagnosis of chronic thromboembolic pulmonary hypertension: comparison of ventilation/perfusion scanning and multidetector computed tomography pulmonary angiography with pulmonary angiography. Nucl Med Commun 2012; 33: 459–463. 3D contrast-enhanced lung perfusion MRI is an effective screening tool for chronic thromboembolic pulmonary hypertension: results from the ASPIRE Registry. Thorax 2013; 68: 677–678. Lung perfusion: MRI vs. SPECT for screening in suspected chronic thromboembolic pulmonary hypertension. J Magn Reson Imaging 2017; 46: 1693–1697. Diagnostic performance of state-of-the-art imaging techniques for morphological assessment of vascular abnormalities in patients with chronic thromboembolic pulmonary hypertension (CTEPH). Eur Radiol 2012; 22: 607–616. Chronic thromboembolic pulmonary hypertension: evaluation with 64-detector row CT versus digital substraction angiography. Eur J Radiol 2009; 71: 49–54. Role of 320-slice CT imaging in the diagnostic workup of patients with chronic thromboembolic pulmonary hypertension. Chest 2013; 143: 1070–1077. Dilatation of bronchial arteries correlates with extent of central disease in patients with chronic thromboembolic pulmonary hypertension. Circ J 2008; 72: 1136–1141. Efficacy and safety of balloon pulmonary angioplasty for chronic thromboembolic pulmonary hypertension guided by cone-beam computed tomography and electrocardiogram-gated area detector computed tomography. Eur J Radiol 2017; 89: 270–276. Long-term outcome of patients with chronic thromboembolic pulmonary hypertension: results from an international prospective registry. Circulation 2016; 133: 859–871. Dynamic risk stratification of patient long-term outcome after pulmonary endarterectomy: results from the united kingdom national cohort. Circulation 2016; 133: 1761–1771. Pulmonary endarterectomy. Patient selection, technical challenges, and outcomes. Ann Am Thorac Soc 2016; 13: Suppl. 3, S240–S247. Pulmonary endarterectomy for distal chronic thromboembolic pulmonary hypertension. J Thorac Cardiovasc Surg 2014; 148: 1005–1011. Operative classification of thromboembolic disease determines outcome after pulmonary endarterectomy. J Thorac Cardiovasc Surg 2002; 124: 1203–1211. Pulmonary endarterectomy in the management of chronic thromboembolic pulmonary hypertension. Eur Respir Rev 2017; 26: 160111. Combined pulmonary endarterectomy and balloon pulmonary angioplasty in patients with chronic thromboembolic pulmonary hypertension. J Heart Lung Transplant 2016; 35: 591–596. Refined balloon pulmonary angioplasty for inoperable patients with chronic thromboembolic pulmonary hypertension. Circ Cardiovasc Interv 2012; 5: 748–755. Percutaneous transluminal pulmonary angioplasty for the treatment of chronic thromboembolic pulmonary hypertension. Circ Cardiovasc Interv 2012; 5: 756–762. Percutaneous transluminal pulmonary angioplasty markedly improves pulmonary hemodynamics and long-term prognosis in patients with chronic thromboembolic pulmonary hypertension. Circ J 2012; 76: 485–488.
. Balloon pulmonary angioplasty for inoperable chronic thromboembolic pulmonary hypertension. Curr Opin Pulm Med 2015; 21: 425–431. Exercise intolerance and ventilatory inefficiency improve early after balloon pulmonary angioplasty in patients with inoperable chronic thromboembolic pulmonary hypertension. Int J Cardiol 2015; 180: 66–68. Right ventricular reverse remodelling after balloon pulmonary angioplasty. Eur Respir J 2014; 43: 1394–1402. Balloon pulmonary angioplasty for treatment of chronic thromboembolic pulmonary hypertension. Circulation 2001; 103: 10–13. Long-term outcomes after percutaneous transluminal pulmonary angioplasty for chronic thromboembolic pulmonary hypertension. Circulation 2016; 134: 2030–2032. Balloon pulmonary angioplasty in patients with inoperable chronic thromboembolic pulmonary hypertension. Heart 2013; 99: 1415–1420. Balloon pulmonary angioplasty in a patient with chronic thromboembolic pulmonary hypertension. Eur Respir Rev 2014; 23: 393–395. Refined balloon pulmonary angioplasty in inoperable chronic thromboembolic pulmonary hypertension – a multi-modality approach to the treated lesion. Int J Cardiol 2014; 177: e139–e141. Balloon pulmonary angioplasty for inoperable patients with chronic thromboembolic pulmonary hypertension: the initial German experience. Eur Respir J 2017; 49: 1602409.
. Balloon pulmonary angioplasty: a treatment option for inoperable patients with chronic thromboembolic pulmonary hypertension. Front Cardiovasc Med 2015; 2: 4. Novel angiographic classification of each vascular lesion in chronic thromboembolic pulmonary hypertension based on selective angiogram and results of balloon pulmonary angioplasty. Circ Cardiovasc Interv 2016; 9: e003318. Refined balloon pulmonary angioplasty driven by combined assessment of intra-arterial anatomy and physiology – multimodal approach to treated lesions in patients with non-operable distal chronic thromboembolic pulmonary hypertension – technique, safety and efficacy of 50 consecutive angioplasties. Int J Cardiol 2016; 15: 228–235. The use of cylexin (CY-1503) in prevention of reperfusion lung injury in patients undergoing pulmonary thromboendarterectomy. Am J Respir Crit Care Med 2000; 162: 14–20. Balloon pulmonary angioplasty in chronic thromboembolic pulmonary hypertension. Eur Respir Rev 2017; 26: 160119. Bosentan for treatment of inoperable chronic thromboembolic pulmonary hypertension: BENEFiT (Bosentan Effects in iNopErable Forms of chronIc Thromboembolic pulmonary hypertension), a randomized, placebo-controlled trial. J Am Coll Cardiol 2008; 52: 2127–2134. Macitentan for the treatment of inoperable chronic thromboembolic pulmonary hypertension (MERIT-1): results from the multicentre, phase 2, randomised, double-blind, placebo-controlled study. Lancet Respir Med 2017; 5: 785–794. Predictors of long-term outcomes in patients treated with riociguat for chronic thromboembolic pulmonary hypertension: data from the CHEST-2 open-label, randomised, long-term extension trial. Lancet Respir Med 2016; 4: 372–380. Pulmonary hypertensive medical therapy in chronic thromboembolic pulmonary hypertension before pulmonary thromboendarterectomy. Circulation 2009; 120: 1248–1254. Operability assessment in CTEPH: lessons from the CHEST-1 study. J Thorac Cardiovasc Surg 2016; 152: 669–674. Surgical management and outcome of patients with chronic thromboembolic pulmonary hypertension: results from an international prospective registry. J Thorac Cardiovasc Surg 2011; 141: 702–710. Reoperative pulmonary thromboendarterectomy. Ann Thorac Surg 1999; 68: 1770–1777.